Typhoon NIDA has passed its peak intensity between last night and this morning. A very small rounded eye indicates extremely strong winds at the center, but it is difficult to keep this intensity for a long period, and the typhoon is expected to weaken gradually from now on. The typhoon is also forecast to slow down after moving toward the current direction, and become stationary in the middle of the Pacific Ocean. Typhoon NIDA has shown rapid intensification in south of Guam, deepening (intensifying) 80hPa in 24 hours from 12 UTC of November 24 to 12 UTC of November 25. This record ranks tie for the 7th in history, meaning that this is a historically significant rapid intensification which is the largest in 25 years since Typhoon 198310 that recorded the rapid intensification of -90hPa in 24 hours. Luckily this typhoon is a little far from Mariana Islands, and Guam is near the edge of the gale wind area, but a rapidly-intensifying typhoon like this is the most dangerous type of typhoons, sometimes causing unexpected accidents in the ocean. The image below shows a very clear eye and thick clouds at the core, indicating that the current situation is completely different from yesterday. 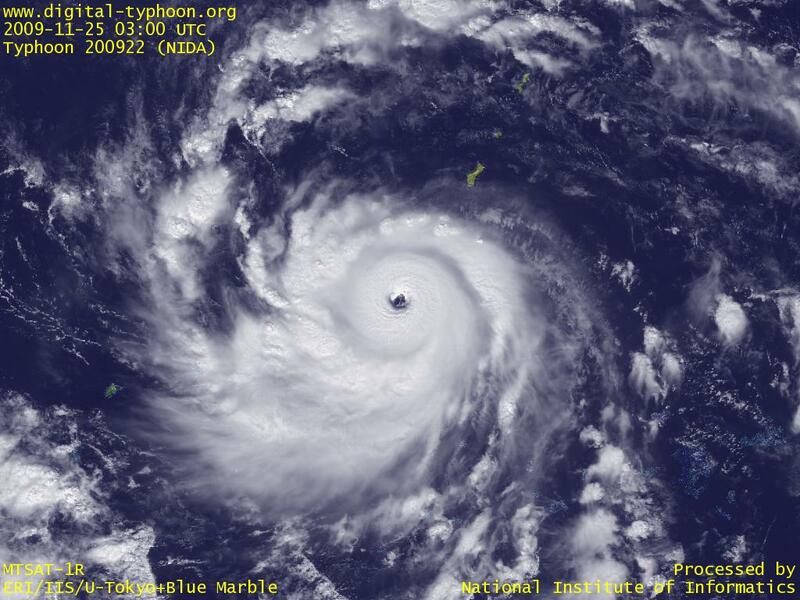 Typhoon NIDA was formed in Caroline Islands. This typhoon is forecast to pass in south of Mariana Islands.